Hey, Remember When People Used To Eat Arsenic As A Health Supplement? Probably not, unless you're well over 100 years old. In the 1800s, arsenic began being marketed as a health supplement, even though it had been a known poison for thousands of years. So why were people suddenly eating it on purpose? Styria, in the southeast of Austria, is a nice place to go these days. In the 1800s, it was the residence of the arsenic-eaters, and by many accounts, it was still a very nice place to go. Adventurers and scientists who traveled to the area mentioned that the inhabitants consumed "ratsbane" with their coffee. The fashion was to take ever increasing amounts a few times a week until diarrhea set in, then decrease the dosage. Men and women took arsenic, sometimes in a dose large enough to kill a healthy human being, to clarify their complexions and help them breathe more easily. Scientists observed that it seemed to do them no harm, writing, "They are generally strong and healthy persons, courageous, pugnacious, and of strong sexual dispositions. " Today, people are no longer impressed with the health benefits of arsenic, inside Austria or outside of it. Not only does it cause cell death, but even low doses of it increase a person's risk of cancer. Whenever natural arsenic has leaked into the drinking water of communities, cancer rates have sky-rocketed. But there is some indication that a people can build up a tolerance for arsenic. Certain towns in the Argentinian Andes, for example, are built on bedrock full of arsenic. The communities there are old, and so is the chemical beneath them. Archaeologists there have examined mummies from thousands of years ago, which contain high quantities of arsenic. Today, people there seem resistant to arsenic, suffering few ill-effects from drinking water full of rat poison. A genetic study of the indigenous population showed that they have the AS3MT gene, which controls a mechanism that lets them flush poisons out of their system faster than most other people, minimizing their exposure to the poison. Whether the arsenic eaters had the same gene is tough to say. Even if they did, they pushed it past the limit many times. Scientists note that the population of Styria suffered a remarkable amount of arsenic-related deaths. Businesses soon decided to share those arsenic-related deaths with the rest of the world. Arsenic was already in fashion in the 1800s. When pale skin was all the rage, an external application allowed women to constrict the capillaries in their face, making them pale. The Styrians gave cosmetics companies a chance to encourage women to take arsenic internally as well. Ad copy was effusive in its praises. "But the Styrian peasant-girl, stirred by an unconsciously growing attachment - confiding scarcely to herself her feelings, and taking counsel of her inherited wisdom only - really adds, by the use of hidri [arsenic], to the natural graces of her filling and rounding form, paints with brighter hues her blushing cheeks and tempting lips, and imparts a new and winning lustre to her sparkling eye." Men took it as well. What else could they do, when scientists came back from Styria talking of the peasants' "strong sexual dispositions"? This had an effect on more than just the complexions or personal health of the people of the late 1800s. Poisoners use whatever is to hand, especially if they can get away with it. Anyone whose rich old uncle or inconvenient suitor dropped dead had two excuses. The poisoner owned arsenic in their possession because they took it for their health, and their victim had arsenic in their system because they, too, took it for their health. Arsenic health tonics didn't last too long. People first heard of the arsenic eaters in the 1860s, and swallowing arsenic was out by the 1920s. The association with poison was too close. 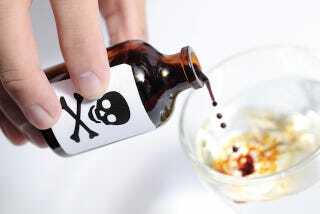 As more and more poisoners were caught, these tonics got the bad press they deserved. And it probably helped that as the world approached the Roaring Twenties, "Austrian peasant girl" wasn't the look anyone was going for anymore.